Today’s guest is Khanh from The Book Nookery! 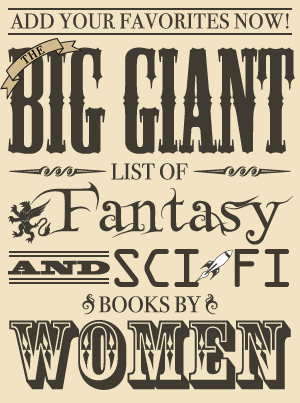 She prolifically reads and discusses books from a wide variety of genres, including speculative fiction, and I enjoy reading her thoughts and insights so much that I frequently read what she writes about books in genres I never read. Her analysis is both thorough and entertaining, and she articulates her points clearly and with a sense of humor. Khanh is one of my favorite reviewers, and I’m thrilled she’s here this month discussing a subject that is near and dear to many of us fantasy fans and the two series that were her gateway to discovering her own love for it. Some little girls dreamed of ponies and unicorns. My girlhood self dreamed of the creatures who ate those horses for a snack. Dragons. I have always loved dragons. Benevolent or malevolent, grand, or just…grandfatherly. Dragons come in all sizes and shapes and temperaments, and I loved them all. My love of these fantastic creatures began with the wonderful Patricia Wrede. I have gone on to read (and love) her other works, but there is no doubt that my adventure began as a 10-year old with the Dealing with Dragons series. I grew up in Vietnam, and in Asian culture, there really was no room for amusing, dry-witted dragons. Our dragons are fierce, they are a force of nature, gods not to be reckoned with. Not so with Patricia Wrede’s dragons. 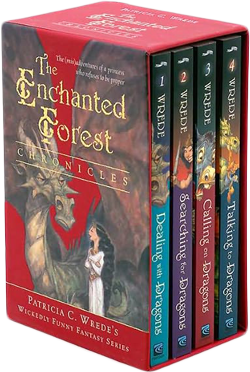 This middle grade series is called The Enchanted Forest Chronicles, and it is by no means a misnomer; from the very first moment I cracked open this book, I was enchanted, enthralled. It is such a good series for younger girls. We have a princess who is not your usual frippery Disney type. She has a backbone, she likes learning, she is intelligent, rational, and never rhymes-with-itchy. She has a boring life. Princess Cimorene wants more. She knows there is a life beyond a forced marriage. And the dragons! Those fierce, fiery, fire-breathing dragons!!!! The ball of fire that accompanied the dragon’s sneeze had reduced the handkerchief to a charred scrap. They’re not particularly fond of eating princesses (princesses are so stringy! ), and they’re not particularly impressive to cats. “He doesn’t seem very impressed,” Cimorene commented in some amusement. “Why should he be?” Kazul said. “Well, you’re a dragon,” Cimorene answered, a little taken aback. To be fair, it’s nigh on impossible to impress a cat. 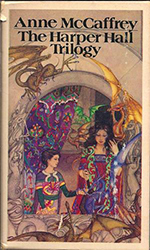 This series started me on yet another…Anne McCaffrey’s Dragons of Pern series. These dragons are more likely to think you taste good with ketchup than the previous dragons. These creatures don’t talk, they communicate telepathically, but they’re rather more grand and awe-inspiring for that. The strong and silent types are always more impressive. Oh, I’m well aware that this is an adult series with very adult topics and some hmm-hmm going on between the dragons themselves, as well as their riders. But what readers may not know that right smack in the middle of this long adult series, there is a subseries that is quite appropriate for younger readers, the Harper Hall trilogy. Of hope and promise on dragonwing. Once again, this series is just excellent for younger readers, younger girls specifically. There is nothing inappropriate here, the romance is light, and it is a beautiful journey of self-discovery, of coming to terms with the fact that your fate doesn’t have to be confined to what society dictates it to be. It is about taking risks, daring to dream. It is the story of Menolly, a girl from a fishing village with extraordinary musical talent. A talent that is forbidden to her because of her gender. In her village, girls are meant to be wives, mothers, helpers to their mate. A career in music, in teaching and playing music, is simply out of the question. It is the story of a girl who runs away and builds her own destiny, along the way, she gathers a clutch of fire lizards…tiny little dragons. It is a part of the Dragonriders of Pern series, and we will encounter familiar faces here (and familiar dragons). The terminology and culture and setting of our beloved land of Pern is very much there, but this book is about the Harper Hall, it is about music, about song. And it is just delightful. Those who love music will appreciate the details that go into Menolly’s musical training. The instruments, the pitches, the lessons; above all else, they feel Menolly’s joy in that she is finally able to do something she loves. This series is a sweet little interlude and a lovely introduction for readers not yet old enough for the main Dragonriders series.